Do you have certain words that are like music to your ears? One of my favorite words is, “toast”. In fact, it’s not just the word that I like, because if I could bottle the aroma of toast (hot out of the toaster), I’d wear its perfume every day! 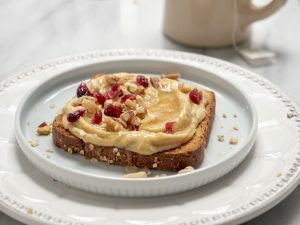 Plant-based proteins are on fire these days and hummus is proud to be a member of this category. This serving provides almost 8 grams of protein — equivalent in protein to about an ounce of chicken or one egg. This is especially attractive to those following a vegetarian or vegan lifestyle. Most of us don’t get enough fiber and this amount supplies a whopping 6 grams of fiber. A diet rich in legumes, like the chickpeas in hummus, has been shown to reduce cholesterol levels and lower risks of heart disease. It’s free from common food allergens like gluten, nuts and dairy yet it’s full of flavor. You can find hummus on supermarket shelves in a variety of flavors to meet your particular desires. It’s a magnet for veggies and whole grains! Who doesn’t like to dunk? You can dip a medley of crispy veggies or whole grain pita into hummus to make a perfect after school snack for the kids or a filling afternoon snack at work. 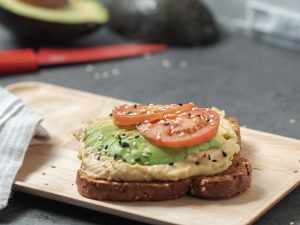 Hummus is so versatile and can be eaten on toast for breakfast, as a dressing on your lunchtime salad, as a snack in the afternoon or as a sauce on your main dish at dinner. 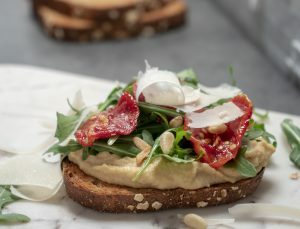 grainy toast, hummus, arugula, sun-dried tomatoes, a few curls of parmesan cheese, and a sprinkle of pignoli nuts.